As the hottest basketball video game, NBA 2K17 – the latest basketball video game released by 2K Sports, is available months ago. Since the most recent NBA 2K game launched, players have been very busy not only with winning games but with also getting all the badges. 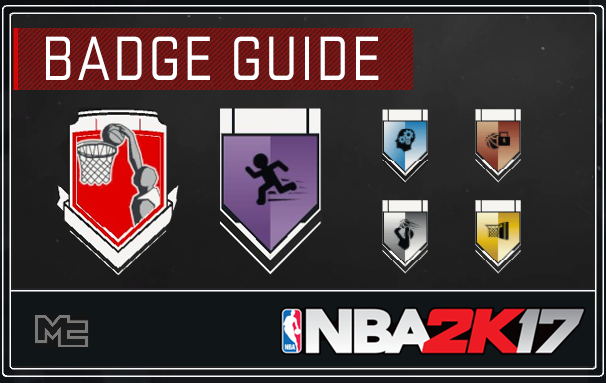 Completing badges in “NBA 2K17″ equals to unlocking every aspect of the game and maximizing the player’s game experience. So without further ado, here are the list of badges in the game and how to unlock them. First in the list of “NBA 2K17″ badge is the Alpha Dog badge which can be claimed by getting the team’s highest overall rating. Then Spark Plug badge can be attained by coming off the bench with a minimum of 7 points. While the Enforcer badge can be received when the player does 10 non-flagrant fouls in a season. The Championship DNA obviously requires the player to win the NBA championship to get it. The Microwave badge will need the player to have 2 red rings for 10 consecutive games to earn it. Lastly is the Expressive badge which can be obtained by just celebrating when the prompt comes up. These badges are not hard to get but do take a while to complete in “NBA 2K17″. For starters, the Dimer badge needs the player to have 300 assists in 20 games, Lob City Passer requires 50 ally oops within one season, Ankle Breaker is earned by getting 200 double moves then a score assist in just one season, Flashy Passer can be received after 50 passes within one season. The easiest one in this batch is the Pick and Roll Maestro badge where the player only needs to get the Dimer first, then PNR Maestro and to the Lob City simultaneously. After this, request for a pick and do a tap Y or Triangle button twice as your man makes a cut to the rim. There are only two defensive badges to go for and that’s the Pick Pocket where the player needs to poke the ball 50 times and the Hustler Rebounder which requires about 400 rebounds. Starting off with the Acrobat badge that needs 4 charge shots and 15 reverse lay-ups to be earned. Tear Dropper needs 50 floaters in one season while Relentless Finisher requires maxing the player’s strength and 75 contact lay-ups. Post-Spin Technician needs 100 drive moves, Drop Stepper needs 30 drop step moves, and Dream-Like Up and Under wants 50 attempts of up and under moves in “NBA 2K17″. For the outside scoring badges, there is the Corner Specialist that needs 25 corner 3 point shots, the Mid-Range Deadeye that needs 60 jump shots, the Limitless Range with 40 3 point shots in the last 30 seconds, Pick and Popper by just setting a screen then rolling out with a 3 points, Difficult Shots badge that requires 200 hop shots, dribble pull ups, step backs, and alike in “NBA 2K17″. Lob City Finisher badge needs 15 ally oops while Posterizer in “NBA 2K17″ wants 15 attempts of contact dunks. Brick wall requires 100 good screens and One Man Fast Break needs 75 fastbreaks in one season. Hope this article would help you to earn NBA 2K17 badges easy. For more of NBA 2K17 Locker Codes, Badges Updates, keep it here on U4NBA.